Two weeks ago, Wonder Spouse and I vacationed on Oak Island, NC — a very southern NC beach that is still relatively undeveloped. As a child, I enjoyed family vacations here, so the area holds a special place in my heart. Wonder Spouse took this photo. 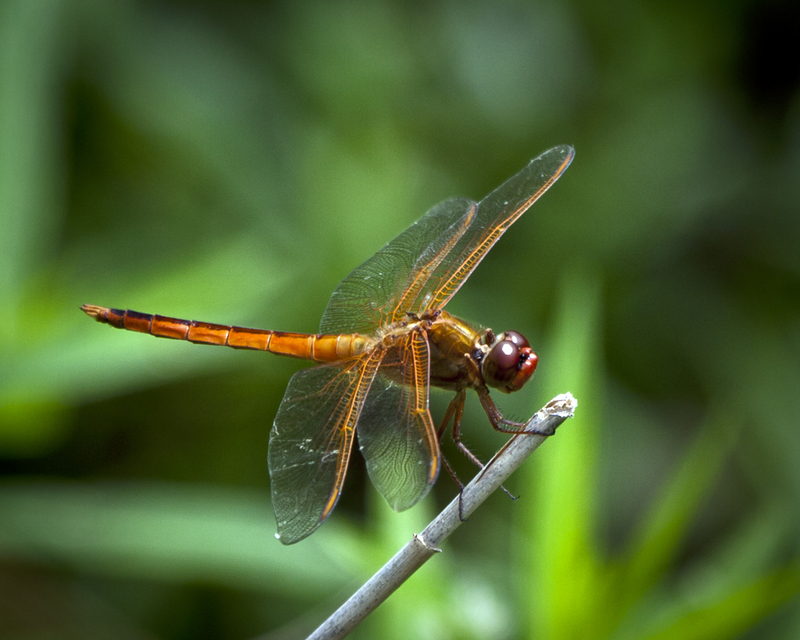 These orange sky dragons dominated the sky around the pond. Thirty-eight summers ago, I spent two wonderful months studying coastal ecology at Duke’s Marine Lab facility in Beaufort, NC, which is a good bit further north of Oak Island. During that summer, I learned the names of numerous coastal ecological communities, and I could identify the plants comprising those varied communities. I think this is a yaupon. Until this recent vacation, beach trips have not given me reason to recall what I learned long ago at the Duke Marine Lab. 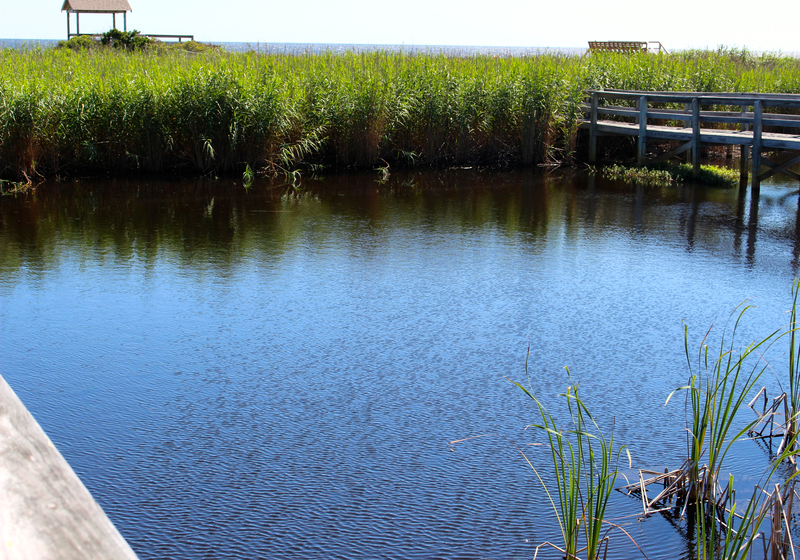 But this year, we rented an extraordinary cottage that, while technically ocean-front, had a freshwater wetland pond between the house and the dunes. Native vegetation and wildlife abounded beyond my wildest dreams of what a beach cottage could offer. 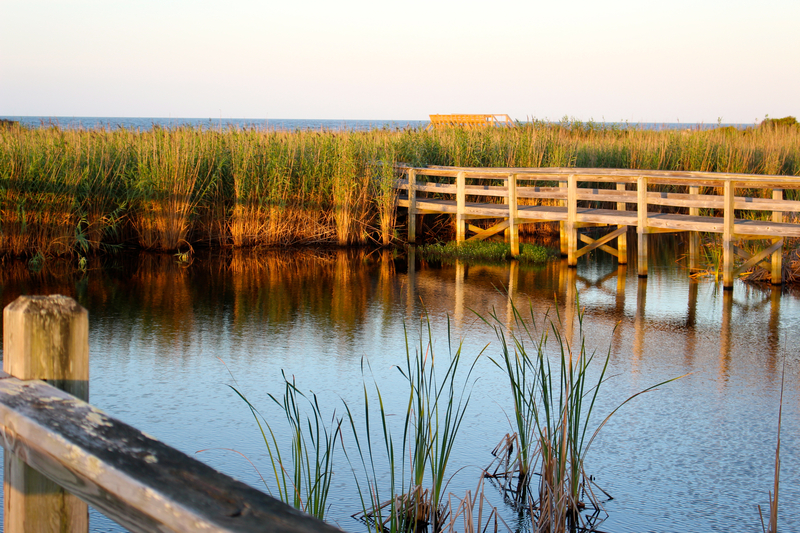 In short, Wonder Spouse and I were beyond delighted to spend numerous hours on the wooden walkway that crossed over the pond to the dunes watching and photographing some of the wildlife living there. A Monet-worthy morning on the pond. I learned long ago at the Duke Marine Lab that coastal ecology is fire-dependent. The various plant communities are healthiest when relatively frequent fires — originally caused by lightning, mostly — burned through the various communities, encouraging seeds of fire-adapted plants to germinate and re-exposing overgrown areas to more sunlight. Turtles abounded in and around the pond, especially the first few days we were there. The dense mix of low-growing trees and shrubs entangled by myriad vines that grew between the beach house and the pond wetland contained a number of coastal plant species that I recognized, but the composition didn’t quite match the community descriptions I remembered. This may be, in part, due to the fact that I doubt these plants have experienced a fire in many years. 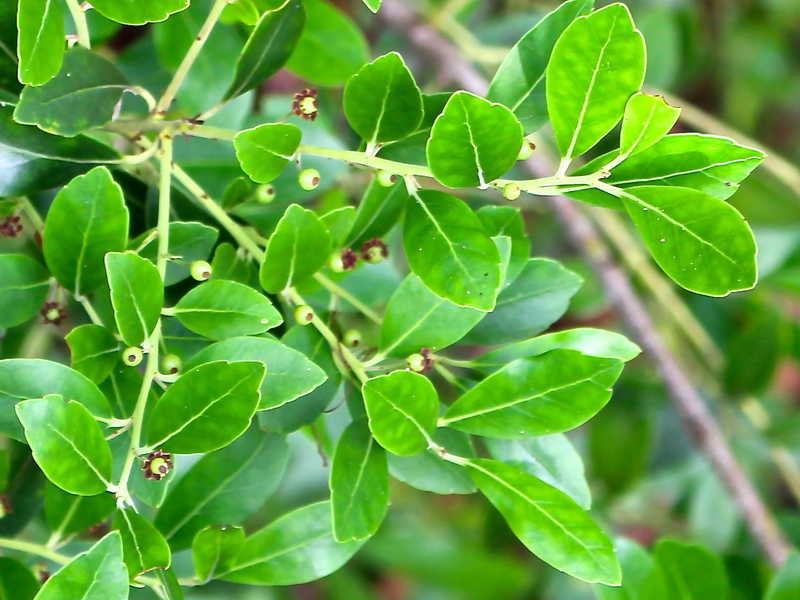 Regardless, the low-growing trees and shrubs seemed healthy, and included familiar species such as Redbay (Persea borbonia), Sweet Bay (Magnolia virginiana), Yaupon (Ilex vomitoria), Pond pine (Pinus serotina), and Wax Myrtle (Morella cerifera) among others. 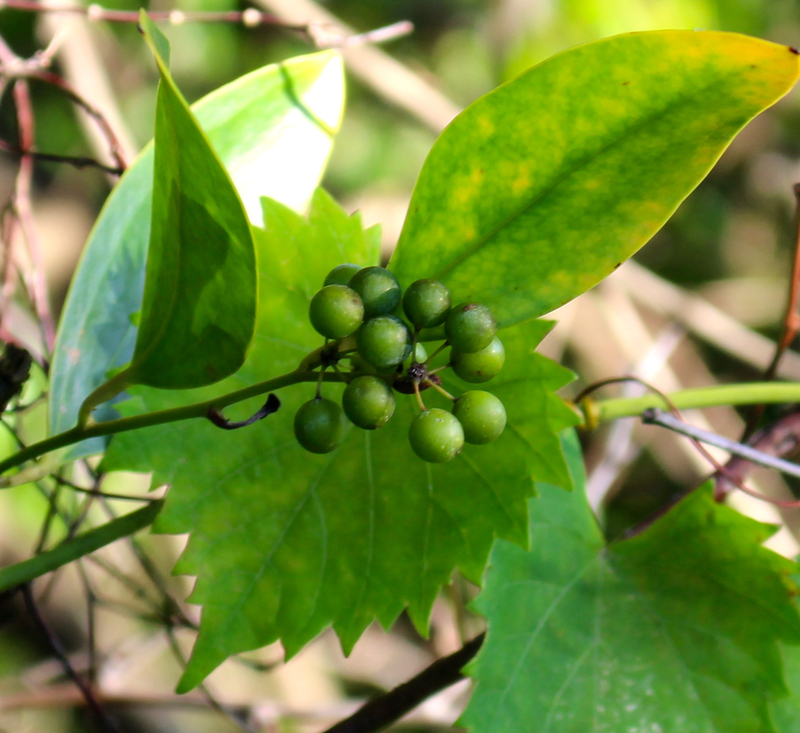 The abundant berries on the Dune Greenbrier intertwined with the scrub forest will eventually ripen to a blue-purple color. Growing over, around, and between these woody plants were numerous vines, including Virginia Creeper (Parthenocissus quinqefolia) covered in flower buds, a grape I didn’t identify, Trumpet Creeper (Campsis radicans), and Dune Greenbrier (Smilax auriculata) ornamented with myriad clusters of green berries. 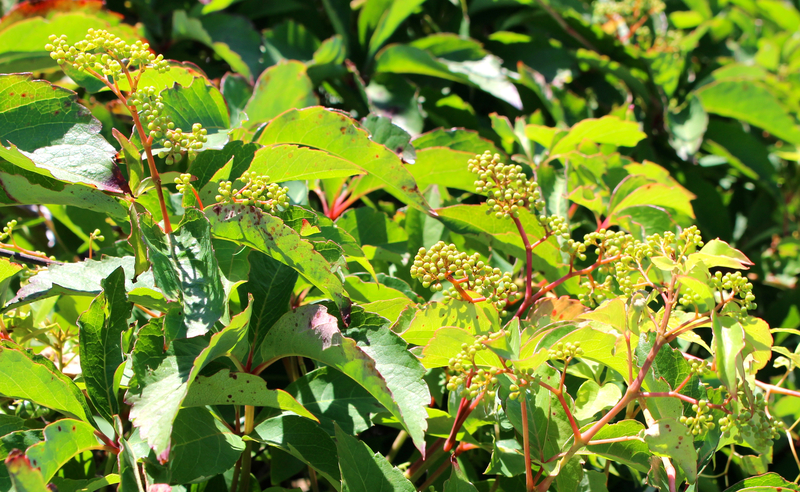 Abundant Virginia Creeper vines were filled with flower buds. Between the scrub forest and the pond, the ground was variably marshy. The dominant vegetation was a reed that I think was probably the invasive form of Phragmites australis. Closer to the scrub forest, the Phragmites was interspersed with ferns, especially Royal Fern (Osmunda regalis), and a few patches of cattails (Typha latifolia), and mats of low-growing plants that I couldn’t get close enough to photograph. Thick growth of what I think is mostly Phragmites. Why didn’t I go charging into the underbrush and into the edge of the marsh, you ask? We weren’t the only species that appreciated the diverse array of frogs, turtles, insects, and birds that abounded in this small wetland. We didn’t see the alligators the first few days we were there, but we did later. More on that shortly. Wonder Spouse took this fabulous photo. A favorite basking spot on the pond. They swam languidly through the dark pond water. A sunrise defense of its territory. 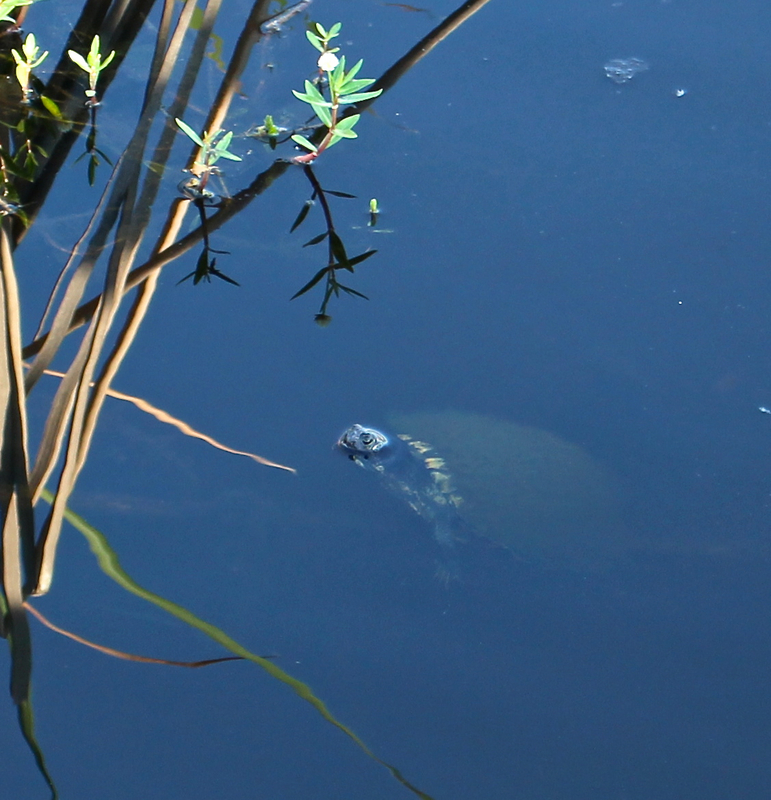 Before the alligators showed up late in the week, turtles of all sizes floated and basked in and around the pond. Great Blue Herons, White Ibis, and Great Egrets stalked the shallows and flew in groups overhead. An Osprey routinely hunted in the pond in front of a nearby beach house. Gulls, sandpipers, and long lines of Brown Pelicans flew overhead during daylight hours. Familiar songbirds from home foraged and nested in the scrub forest, including Blue Jays, Northern Cardinals, Carolina Wrens, and Brown Thrashers. Red-winged Blackbirds dominated the reeds in the marsh. Feisty males flashed their scarlet shoulder pads at us as they tried to hurry us along the walk and away from their harems of females nesting in the thick reeds. At night, numerous species of frogs croaked and trilled, drowning out the wave sounds of a calm ocean. In the middle of the week, the turtles seemed to disappear, as did the wading birds. 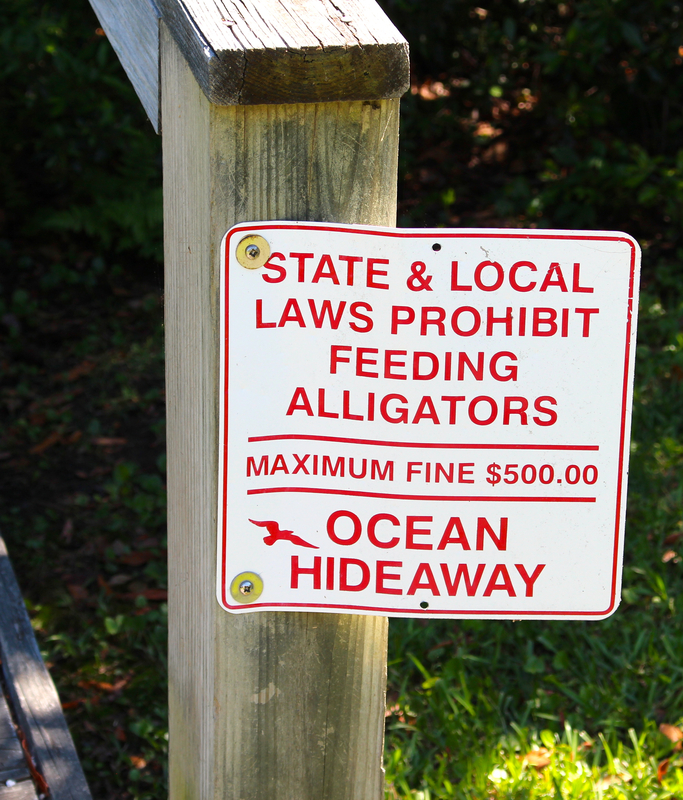 We spotted a large — at least seven-feet-long alligator cruising around the pond. As we stood on the walkway talking excitedly about it, it silently coasted into a position just beneath us. 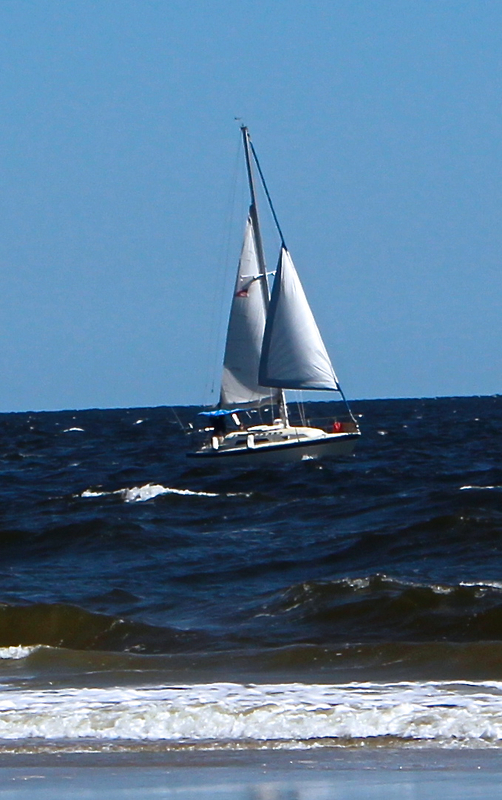 Only its massive head was visible above the water line. It seemed to dare us to dip a leg over the walkway. I got the heebie jeebies and went back to the house while Wonder Spouse took photos. He hasn’t processed them yet, so I can’t show them to you. Trust me, that creature was creepy. The young ones we spotted the next day were a tad less intimidating. 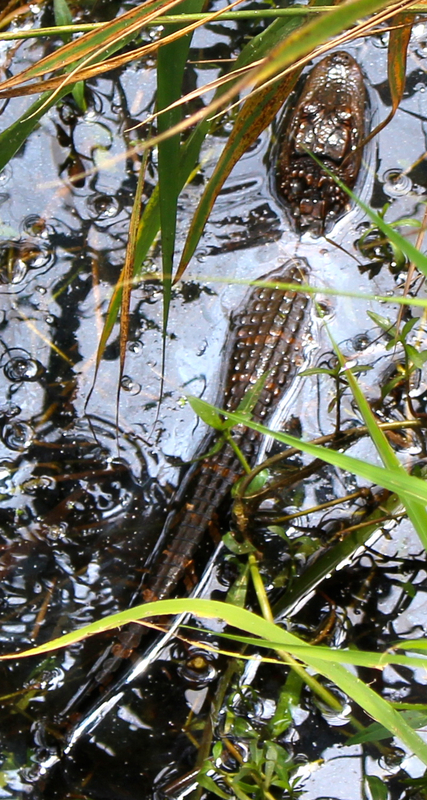 A young alligator, about 2.5 feet long. 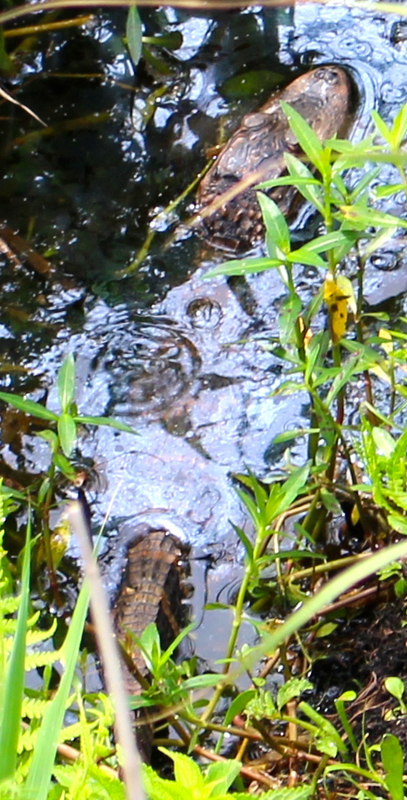 This younger alligator seemed content to float in the shallow end of the pond among the reeds. It allowed us to photograph it for quite a while. We thought it was barely awake, until suddenly a large, long black snake leapt into the air, reaching for the top of the reeds. We hadn’t seen it, but this young alligator did. I am not exaggerating when I tell you that this snake put three feet of air between its tail and the alligator’s mouth in a matter of seconds. We had no idea a black snake could make a vertical leap of that magnitude. It is a lesson I will not soon forget. And yes, the snake escaped; alligators are evidently not great leapers. 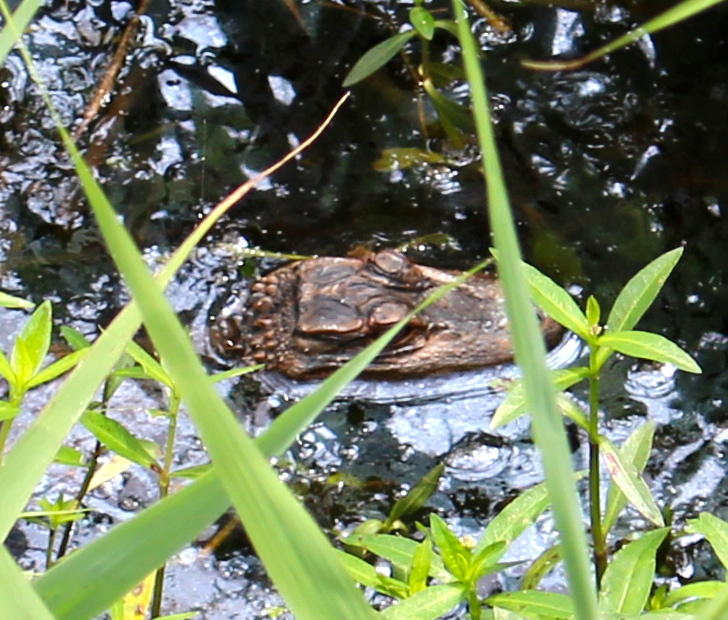 This smaller alligator was only about 1.5 feet long. This smaller alligator was more colorful, which I read is characteristic of this reptile species when it is young. We could almost imagine how someone might think such a creature would be an interesting pet. Almost. The memory of its fully grown relative we had seen the previous day was still much too fresh in my mind to give such a thought even semi-serious consideration. 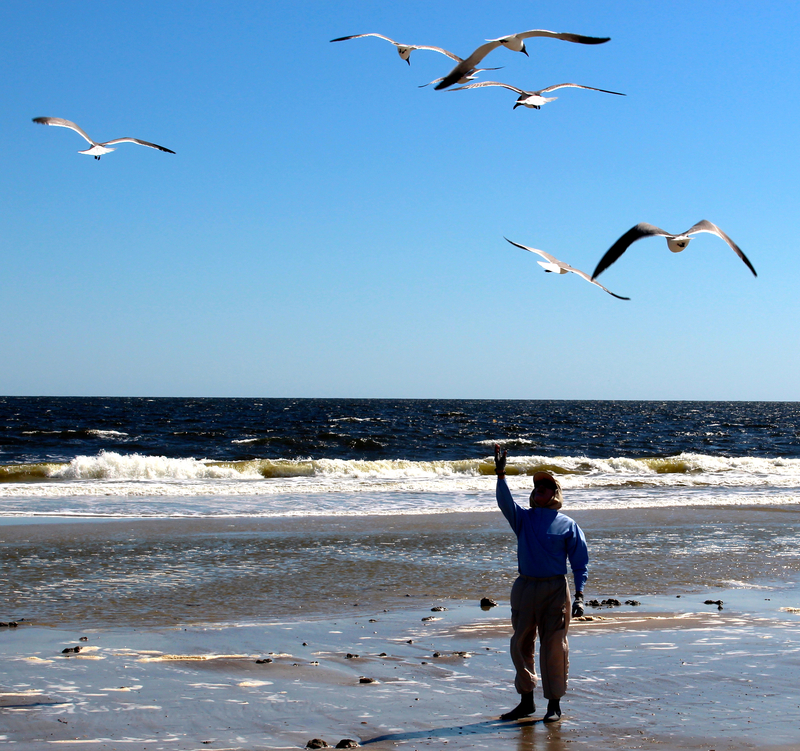 Wonder Spouse teasing gulls on the beach. No, we didn’t spend our entire vacation watching the pond creatures. We made it onto the beach for long walks at sunrise and sunset, when the light was most interesting for photographs. The beach was littered with the bodies of jellyfish, which I was told was normal at this time of year. Intact shells were hard to find, except for tiny perfect ones, mostly overlooked by other beachcombers. I tried to photograph the Brown Pelicans as they arrowed into the ocean after fish. All I caught was the splash as they hit the water. We found a few young hermit crabs inhabiting tiny shells, like this one inhabiting an auger shell held by Wonder Spouse. The most wonderful surprise came during a midweek sunrise walk on the beach. We spotted two women in a small vehicle; they were volunteers with the Oak Island Sea Turtle Protection Program, and they had just located and marked a new nest deposited by a female a few hours earlier. The tracks of the mother turtle as she laboriously pulled herself up above the high tide line and then returned to the sea were still visible, unmarred by pedestrian foot traffic. And most fortunate of all, I was carrying my camera. Without the tracks of the mother turtle to follow, I would not have guessed this was the nesting site. The volunteers mark every nest with flagging tape and a sign. A close-up of the tracks left by the turtle as she pushed herself above the high tide line. The tracks on the left are from her ascent to the nest; the tracks on the right mark her return to the sea. A view from the nest. Tracks on the left mark her return to the sea. The tracks stop at the point from which she emerged from the ocean. The jellyfish that littered the beach are a favorite food of sea turtles, I’m told; Mother Nature’s timing was once again impeccable. All in all, it was a perfect week filled with natural wonders that this Piedmonter has either not seen often or never seen at all. Tracks of the gull that caught this crab were still visible. A sand crab dug its daylight hiding hole beside a beached jellyfish — snack food? I missed my Piedmont gardens while I was away. But there is something deeply restorative about breathing salt air and meditating upon a tranquil sea at sunrise. The re-centering has come in handy now that I’m back in the Piedmont. My return week has been full of weeds, groundhog damage, and amorous black rat snakes. I’ll fill you in on all of that next time. This entry was posted on May 28, 2017, 9:37 pm and is filed under Conservation Corner, Native Wildlife. You can follow any responses to this entry through RSS 2.0. You can skip to the end and leave a response. Pinging is currently not allowed.